Seattle is Lumping All its Homeless Children Into One School – LET's Blog! 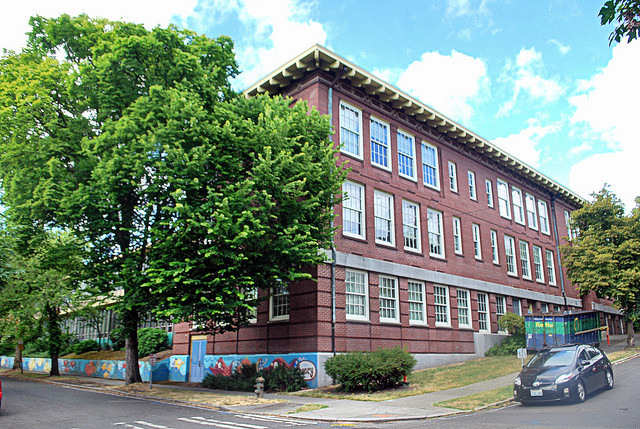 Lowell Elementary School, located in Seattle’s Capitol Hill district. Photo credit: Joe Wolf via Flickr Creative Commons. Seattle students who live in Eastlake mostly go to Tops K-8, a highly rated elementary school with a park-like yard and a lake view. Unless those students’ home address is Peer80 Homeless Shelter, barely four blocks away. For all of the homeless shelters in metropolitan Seattle, the assigned elementary school is Lowell Elementary, up on Capitol Hill. Seattle’s best estimate is that 7% of the youths in their school district lack a permanent address. At Lowell, it’s slightly over 20%. More than one in five students at this school don’t have stable housing. Absolutely no one likes it there, it seems. Students report violence, bullying, and apathetic staff. And the staff claims they aren’t adequately supported to take care of students with special needs. The high turnover rate is both a symptom and an exacerbating factor; 15 teachers and staff members have left since the beginning of 2017. Homeless students are more likely than the average to be in need of special accommodations. There are students with untreated mental and physical disabilities, including PTSD. A large percentage of students barely speak English. But funding matters have prevented the school from having a stable support staff. “You got to go through the shelter life, and then you go to school with all that stuff inside: ‘Why are we still here? Why do we still have to go through this communal eating? Why don’t we have our own stuff?’ And they’re bitter, and they’re hurt, and they’re angry,” said the mother of several Lowell students. “And so when they arrive into the classroom, they bring all that angst with them, and for the most part don’t come in with those coping skills to kind of get them to a place where they can access the learning,” said former assistant principal Na’Ceshia Holmes, one of the staff who quit this year. With more training and a dedicated mental health staff, perhaps this school could be a light for students. But as it is, funneling the city’s growing population of homeless youth into one inadequate school is simply harmful.